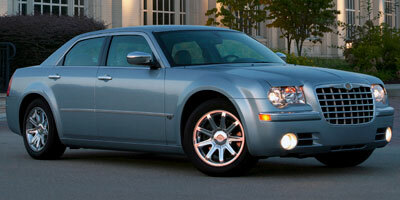 To call the Chrysler 300C long in the tooth would be a perfectly accurate statement. It has been in production since 2005, but a look at its underpinnings reveals a lineage that dates all the way back to the DaimlerChrysler days, when not-so-profitable Chrysler was under the watchful ownership of Mercedes-Benz. As such, Chrysler vehicles had access to Mercedes-Benz’s wide array of chassis designs, and parts of the 300C’s suspension design, transmission design and steering – amongst other components – date all the way back to the W210 Mercedes-Benz E-Class that was first produced in 1995. So how can this car compete in 2009 given that it contains an aging design wrapped around a downright old platform? Well, it turns out a cosseting, once elegant German sedan is just the place to start if you want to build a cosseting American sedan (strange, we know), and long stints on the highway are where the 300C excels. But the SRT8 has another trick up its sleeve – a 6.1-liter, 425 horsepower Hemi V-8 that sees the boat-like sedan to 60 mph in under six seconds. That makes it a bit of a two-face, and while the massive engine does add a lot of appeal, parts of the 300C still find a difficult task in hiding its age. Power and plush comfort are the 300Cs strong points, but this is no cut-rate super sedan, and it’s best not pushed in the corners. The engine has a very Detroit sound to it and, without a doubt, it’s a bruiser in a straight line, with old-school rear-drive dynamics and more torque than you’ll know what to do with. Revised suspension tuning and added standard equipment for 2009 are much appreciated additions. While the 300C oozed style when it was released, it’s starting to show its age, though it is probably still the most hip car produced by Chrysler. Shorter drivers will have visibility issues due to the 300Cs high beltline. Pricing seems a bit steep, especially given the other options in the market. The gas guzzler tax doesn’t help, either. While it’s nowhere near the last word in lightweight design, the 300C remains an absolute brute in a straight line, and it feels good for every one of its claimed 425 horses. And you’ll mash it over and over again thanks to the Reconfigurable Display’s (RCD) performance data, which measures 0-60 times and quarter mile times, amongst other performance stats. The steering is a bit numb and doesn’t inspire too much confidence, but the brakes are simply phenomenal for a sedan of this size. Overall the ride is firm and controlled – some of which can be attributed to low-profile tires and massive 20-inch rims – but it’s rarely jarring or intrusive when it comes to ride comfort. The 300C is powered by a 6.1-liter Hemi engine that pushes out an impressive 425 horsepower and 420 lb-ft of torque and can turn rear tire rubber into plumes of smoke on demand. Power is driven to the rear wheels by a five-speed automatic transmission with a manual shift option. Chrysler’s Media Center touchscreen system costs extra, but it’s well worth it and adds a CD/DVD drive, 20 GB hard drive and navigation with live traffic, plus Sirius Backseat TV, a mobile television service. The RCD performance data system is a cool bonus feature on the SRT8, providing performance numbers such as 0-60 times and quarter mile times. For just $685, buyers can upgrade the 300C’s audio system to a 13-speaker Kicker high-performance system that also adds a 100-watt subwoofer and 322-watt amplifier. A one-year Sirius satellite radio subscription is an appreciated plus. 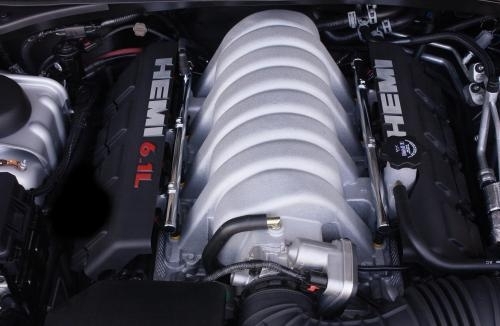 Hemi power has never been synonymous with fuel economy, and despite many efficiency gains since the late ‘60s, the design is still inherently gas hungry. Expect 13 mpg city and 19 mpg highway in the SRT8. 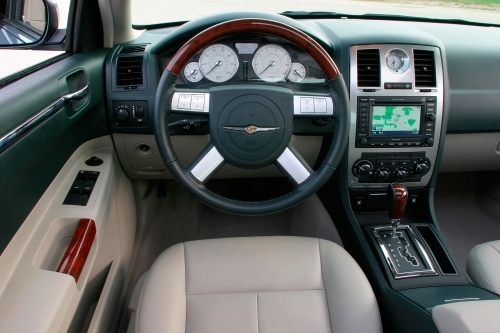 The 300C isn’t quite as cavernous as it appears from the outside, and its relatively cozy cabin is a nice surprise. The SRT8 seats have supportive side bolsters that aren’t overly intrusive – a good thing since few will be pushing hard through the corners – and it’s a comfortable place to spend a few hundred miles when need be. On the bad side, the gauges look a bit dated and there are some hard plastics here and there. It might be starting to show its age, but there is no doubting this car’s presence thanks to its massive front grille and 20-inch wheels. A high beltline gives it a hot rod-style look that’s been copied by other manufacturers over the years. 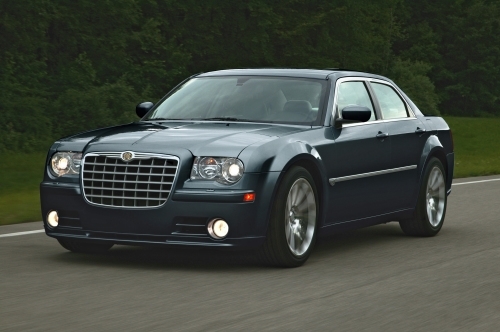 At $47,315, the 300C SRT8 puts itself in dangerous territory. While we would consider it a competitor to cars more along the lines of the $37,770 Ford Taurus SHO, $38,655 Acura TL SH-AWD or $39,500 Hyundai Genesis 4.6, its price tag suggests much more sophisticated competition such as the $50,200 Audi A6 3.0T and $52,150 Infiniti M45. It might be getting a bit old, but the Chrysler 300C still has some life left in it, especially considering how Chrysler’s recent reorganization has put new product development behind schedule. As for the SRT8, however, it feels like a relic from the past, with a price tag that’s too high for a brute-force engine crammed into an aging chassis.